Johannes or Jan Vermeer was Dutch painter who had moderate success during his lifetime but was revered as one of the greatest painters during the Dutch Golden Age after his death. Born in 1632, his father was a silk worker and they were from a middle-class family. He specialized in domestic interior scenes, and seldom strayed from his provincial genre. Although an excellent painter, he produced very few paintings throughout his career, leaving his family in debt. 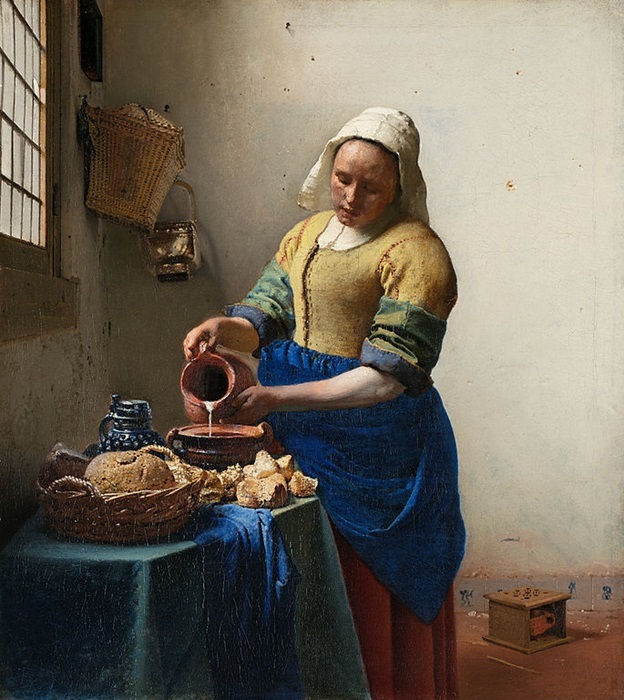 Vermeer was noted for painting with great care and precision and for using expensive and bright colors. He had a preference for Indian yellow and lapis lazuli, which he used very often. He was also a master of the effective use of light in his creations. 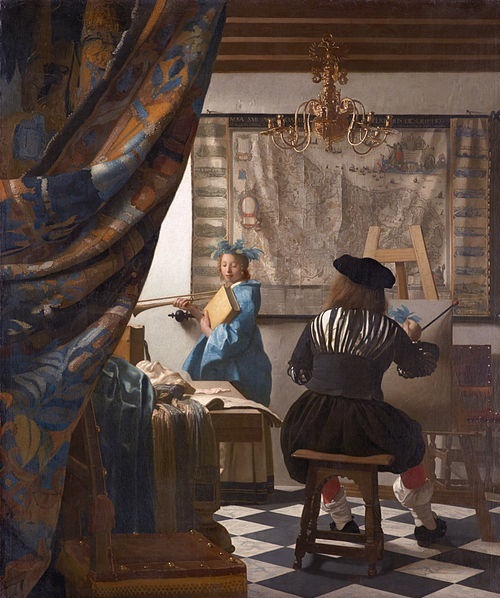 A characteristic of Vermeer’s paintings was the setting. Since he specialized in domestic interior set-ups, most of his paintings were done indoors, using two small rooms in his house located in Delft. The same decorations and furniture were used and rearranged when needed. He almost always used the same models, mostly women, as well. However few his paintings were, Vermeer was recognized in The Hague and in Delft during his lifetime. But he was relegated to obscurity after he died. Connoisseurs appreciated his works two centuries after Vermeer died. There were works that were attributed to other artists like Mieris (Metsu). In 1860, Gustav Waagen, the German Kaiser-Friedrich Museum director saw “The Art of Painting” in the Czernin Gallery in Vienna, he recognized it as a Vermeer. At that time the painting, which was also called “Painter in his Studio” and “The Allegory of Painting” was ascribed to Pieter de Hooch. The 17th century painting showed a painter in front of a canvas, with a female model sitting near a window where filtered light pours in. By the props used in the painting, Vermeer was revealed to be creating a painting of the Muse of History, Clio. It was not a commissioned work and the artist kept it in his possession until his death. His wife was forced to sell it and was acquired in 1813 by the Czernin family. 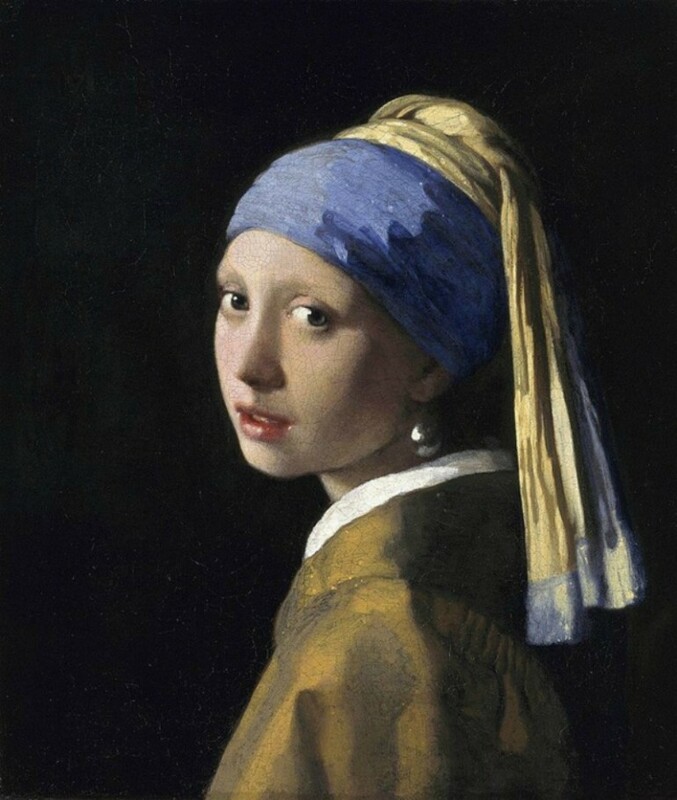 It’s considered a very important work of Vermeer and was valued (low estimate) at $211 million or 150 million euros. At the time that Hitler bought the painting, he paid about $660,000. It is now at the Kunsthistorisches Museum in Vienna and is the only painting of Vermeer that found its way in Austria. There are only 34 paintings that are recognized today as Vermeer originals and all of them are in museums, including the Rijksmuseum in Amsterdam, Gemaeldegalerie in Dresden, the Metropolitan Museum in New York, the National Gallery in London and the Louvre in Paris. French art critic and journalist Théophile Thoré-Bürger did a research on Vermeer and in 1866 published in the Gazette des Beaux-Arts his catalogue raisonné of the works of the Dutch artist. This led the international art community to focus their eyes on Jan Vermeer. There were 70 works that were included in the list, but only 34 is the accepted number of his own works today. Since Vermeer’s rediscovery, many top Dutch artists such as Simon Duiker, emulated Vermeer’s style. Others that were inspired by Vermeer were American painter Thomas Wilmer Dewing and Danish artist Wilhelm Hammershoi. Salvador Dalí became one of his admirers as well, painting his own interpretation of “The Lacemaker” and “The Ghost of Vermeer of Delft Which Can Be Used As a Table,” a painting he did in 1934 that immortalized the great Dutch painter. Very little is known of the early life of Vermeer. Most of what’s known today came from comments by other contemporary artists, official documents and other registers. It seemed that Vermeer devoted most of his life to his art exclusively, and stayed in Delft all the time. Some of the other details of Vermeer’s life were taken from Delft city archives. Up to this day it was not clear where Vermeer took his artist apprenticeship. Some thought that Vermeer was self-taught, while others ventured that he was trained by Abraham Bloemaert, a Catholic painter. Upon analysis, historians think that like his contemporaries Vermeer initially prepared his paintings tonally by using browns and grays or by grisaille (shades of gray). Over this was put a layer of saturated colors in blues, yellows and reds) like transparent glazes, since no drawings were seen in his possessions and there were scant clues on how he did his preparatory work. It is believed that no other artist in the 17th century used paints lavishly as Vermeer. Pigments such as natural ultramarine, made from lapis lazuli cost more than gold in the 17th century and it was one of Vermeer’s favored colors. He also mastered the use of warm colors such as ochre and umber, which he carefully used in creating their multicolored reflection on the walls. Historians supposed that Vermeer understood Leonardo da Vinci’s observations on how the surface of each type of object reflects the color of the object near it, therefore no object could be seen in its natural color entirely. This could be seen in “The Girl with a Wineglass” where the red satin dress of the model was underpainted in natural ultramarine thus the mixture of vermilion and red lake over the blue created a slightly purplish color that was crisp and cool. Vermeer’s style was quite photorealistic, prompting people to think that Vermeer, like Diego Velásquez and Hans Holbein and other Renaissance artists used optics and curved mirror combinations of camera lucida and camera obscura. But the theories remain as they are to this day, because during an inventory of the artist’s possession upon his death, no device that would indicate he used mechanical tools to accurately depict perspective, light and reflections as well as exact color values were found.